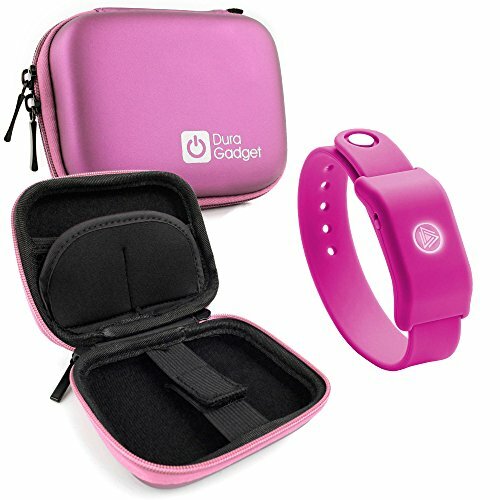 Introducing DURAGADGET's new rigid zip case for your wearable. With a soft, felt lining and durable outer shell, this case provides maximum protection for your device. The executive looking case features a sturdy dual zip-closure to the main compartment, lending extra security and ensuring your device is kept dust and scratch free. Equipped with a handy mini carabiner, you can easily keep your wearable device close by when you leave your car or house, providing added versatility and choice in the transportation of the gadget. An inner elasticised strap will keep your important gadget firmly in place. Water and shock resistant material to give you peace of mind about the safety and security of your device. Inner memory card pockets and netted storage pocket within the main compartment allows for the option of keeping your accessories close by at all times. This sleek case is finished in classic pink, so you can transport or store your precious device in style. Please note: This purchase is for 1x Hard EVA Case ONLY and does not include any other devices shown in our images. Garmin 60csx & 60 series CASE made by GizzMoVest LLC in 'Special Ops Black'. Molded Protection includes METAL Belt Clip, Lanyard-Clip. MADE IN THE USA.